I went on a walk today in a place I have been only once before. That time I didn't venture far, but I liked the feeling it gave me. There are several canyons coming off a mountain range in an area that looks pretty flat and barren. To most eyes it would appear 'wide open, yes, but kind of plain... and... brown'. Ah, but as I tell people when they have this sort of reaction: It's a trick! This is where wonder often waits, as I have learned here over and over again. So today, I decided I would spend the day in these canyons and see what I came across. It's very lightly visited which is second best to never-visited as far as wild walks go. It's very easy to leave the trail behind and walk as you may around the land. It isn't crawling with predators or plentiful loud talkers (give me mountain lions or give me death). It is the best way to 'hike', to me, for this is when Spirit is heard best. 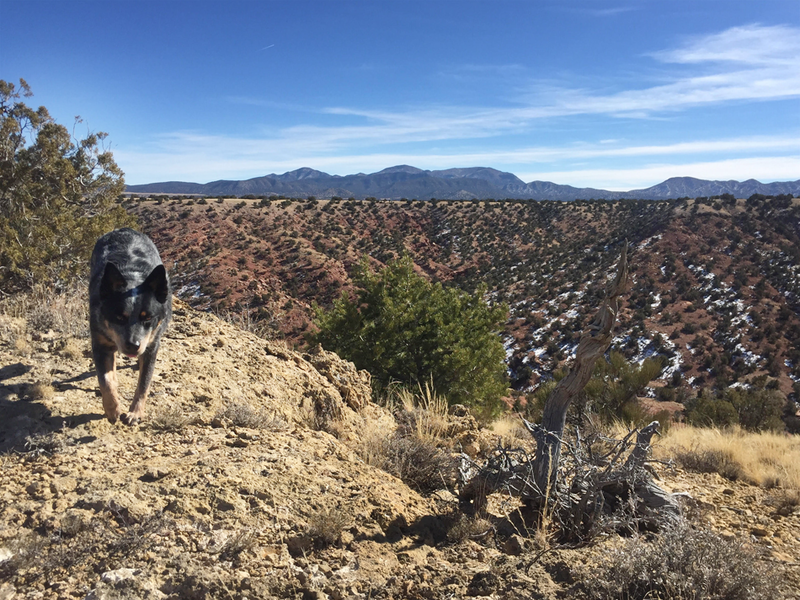 I decided I would begin by climbing to one of the peaks, most of them cliffs along the mesa overlooking the many thousands of pristine acres below. I wanted one that wouldn't send me plummeting down its rocks, but would give me a good lay of the land to plan my whereabouts. When I got to the top, I put my arms out like a bird and closed my eyes, feeling the winds over me. I pretended to fly to some beautiful place and I could feel something special was near—a gentle 'Yes, this is what you will find', felt in my bones. Turning slow in a circle, 360 degrees were visible and sitting a mile or so away, there was a big arroyo that wandered as far as I could see. I had another feeling: 'Walk that one'. 'That big one over there?' I asked back in breath. A raven appeared in the distance and made my favorite sound in their otherworldly language. He flew along the arroyo, my feathered answer. When I got down to it, the dry river bed and its rock banks were grand. The further I walked, the sanded path widened and the walls grew taller, until I was in a canyon. Here, at the entry, I felt as if I was a pilgrim walking into a temple, compelled to reverence. Straight red rock walls hundreds of feet high formed a sort of gate, like people built into mountains during antiquity—likenesses of pharaohs, sphinxes, and gods. I was now in land with no human footprints, no bike tire tracks, no orange peels, sunglass lenses, underpants, or other wares that tend to fall off of hikers puzzlingly unmissed. 'Keep going' was what I felt repeatedly, and it felt Good, so I did. I was captivated by the land growing and forming before me. 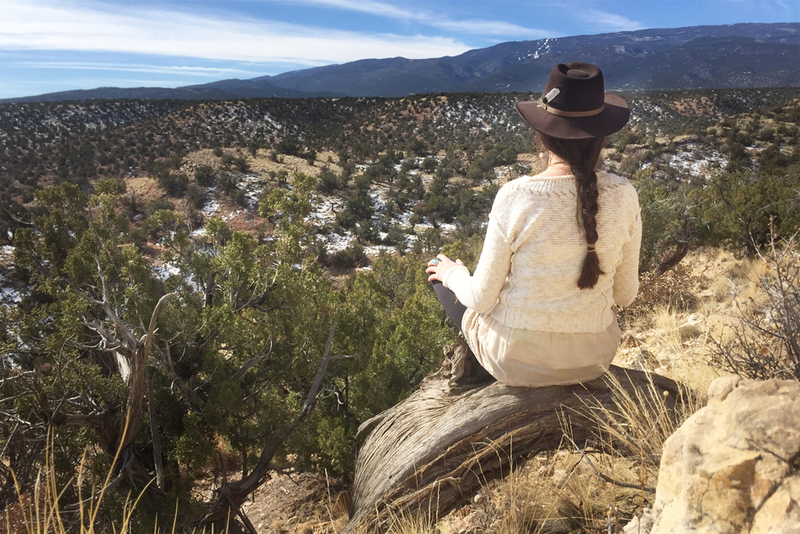 What I began to hear with my ears was from Other: sage rustling where animals were not, small rocks rolling down from high right next to me, traces of whistles, pieces of a distant woman's laugh, a blown whisper next to my ear when wind wasn't there. I would see a figure—human, coyote, bird—in my peripheral vision but if I turned to look it was a rock, a twisted juniper, or nothing except blue sky. These things need no explanation for me, they make me feel less alone in this world. All of this mesa and canyon land is very very dry. Aside from one arroyo during monsoons, water has not run through the beds in thousands (or perhaps even millions) of years. Trees have shriveled up and cactus spreads. Rock reigns here. As I walked, I noticed less prickly things as growing grass appeared under my feet. The sand became darker, and animal prints became crisp in the richer dirt. I realized water was somewhere nearby and the thrill of discovering the unexpected and near-impossible ran through me. The sweet smell of cottonwoods hit my nose, those great gurglers of creeks and springs, and now I was certain. 'There is a spring', Spirit said and then I heard water trickling. I saw not just mud like the typical (although rare) spring here, but a clear flowing stream—gold and life, the desert's enlightenment. Oh how the land changed, with this abundance of water. The sand undulated, powder soft and so fine that when I held it I could not see the grains. I put my nose to the ground and even the earth smelled of cottonwood. Grasses, dry from winter, I could see would lay over this place as green as the summer cottonwood leaves above. Flowering plants lined the small banks, empty branches now that would bloom anew in spring. How good every earthen texture here would feel on bare skin. I could do nothing else but stand there and let the tears well in my eyes, the unexpected beauty too overwhelming to hold in. I was gifted with a vision here, but that is mine to keep. I came upon a young lady hawk eating a catch, still warm, for lunch. I was only feet from her, we were under the same tree. She didn't see me first, so I was able to watch her. Razor beak and ancient unknowable eyes pulled out the gentle rabbit's entrails, the perfect sweet fur I love so flying everywhere. The inside of the head was the final treasured treat. It was furious and primal, painful and illuminating. Kya caught wind, ran to investigate, and the hawk took off. The loudness of her wings in flight was startling. I felt their wind when she was ten feet away. She followed us as we walked away, curious and hopping along branches close to me, watching and tilting her head. It felt as if she forgot about her meal and found us more interesting instead. A powerful bird, and a most beautiful blessing even with death. The stream flows down and pools into a spot big enough to sit in up to the neck, perfect for a rock to be placed there for sitting. In the entire length I traced, the water is crystal clear, and at the pool a tiny waterfall glints in the sun and keeps the soul flowing, always. The cottonwoods are young, not as tall as older ones, but thick at the trunk and plenty enough for shade in the heat of midsummer. It is a place that is sacred, and I knew by the whispers and whistles that I am not the only one that shares in visiting. Other than animals and kindred wild folk, I tend to prefer my companions on hikes and dips to be unseen, so that is all okay with me. During my walk back, I ruminated on what I will give in reciprocity for the gifts I received today. I walked in thanks, reverence, and knowing.